These original songs are upbeat, catchy and appealing to children and adults. Introducing the sounds and phrases of Indonesian has never been so easy – or so fun. 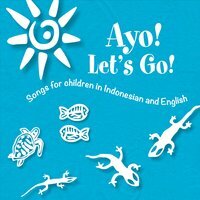 Introducing the sounds and phrases of Indonesian in a fun and engaging way, these bilingual songs are performed by Indonesian musicians and singers. With catchy melodies and entertaining stories, your child can sing along. What do you say in the morning? Selamat pagi! Do you like Bali? Suka sekali!